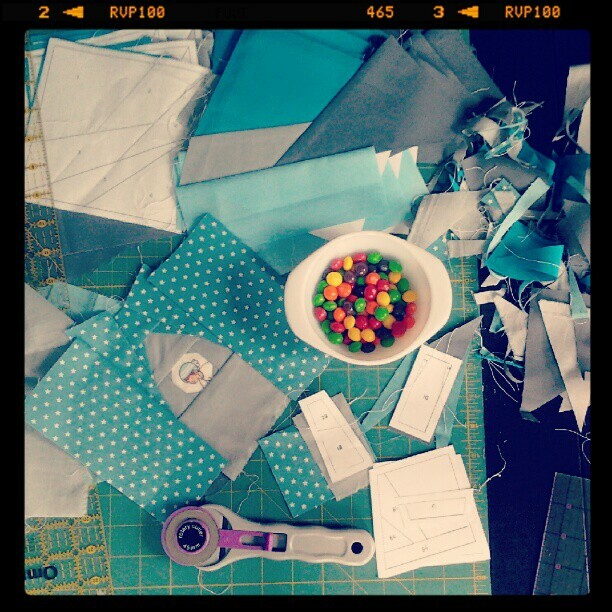 snips snippets: It's a paper piecing party! So my plan of attack for today was to work through the stack of 16 paper patterns i've had on the go for a pillow, sort of as practice for my new love... paper piecing. So i thought i'd try something simple, large pieces and straight forward. Enter Icky Thump from Julie over at 627handworks. It started well... then it all went to pot. Okay, so the four blocks up in the top of the photo, see the little white paper corners sticking out from behind the light grey? Yeah, those are supposed to be covered up. You'll also notice that i manged to sew on the next section of the block on all four before noticing my mistake. Way to go me! So when i did notice my mistake i thought i would just assemble one whole block... which equals four of those little blocks. You know, to see how it was going to look, i had already started getting that feeling that i wasn't going to like it. And I don't like it... first, i meant to have the more cobalt blue corners in the center so the block forms more of a diamond pattern, not a circle. Second, my colour choices... they looked good together when i pulled them, but now i'm just not diggin' it. So i've stopped. I shall revisit them at a later date. Maybe i'll get rid of the two bluey blues and replace them with more aqua/turquoisey blues? Or maybe it's the greys i'm not liking? ...besides making a mess and eating skittles that is. I made a rocket! With a passenger! Not bad for a test run, if i do say so myself. My piecing still needs work, but the pattern went together beautifully, and a lot quicker than i expected. I love it! And when Sammy came home from his grandmas today he immediately went running to the wall where it was taped up and said that he loved my new quilt! (he thinks anything i do with fabric is a quilt, even if it's just sample fabrics stuck on my design wall. he's so cute!) He was quite excited when i told him it was going to be a pillow for his bed, and wanted to take it with him to bed as is :) I think that makes it a winner in my books! I'm linking up with Kristy for the first ever Paper Piecing Party! Come on over, i'm sure there's going to be great things to see! High fives to the wonderfully awesome Gina, for making this happen, and to the amazing Kristy for designing a cool rocket for my little guy! Looks so beautiful and I love the colours! What a great rocket! cutest rocket ever!!! way to go; you whipped that up so quickly!! I love your fabric choices and the rocket man in the middle is perfect. I also like your orb block too and think the colors look great!! Ooh I quite like the blues in the first block! I think they look fabulous! The rocket is perfect. Nice job! super cool rocket, with a sweet passenger...it is going to be a super cute pillow! These are awesome! I just adore the rocket with the passenger! I detest unpicking paper piecing. I have only had to unpick once or twice and that was like a year ago but it is ingrained in my memory. The rockets are so cute! I do like your top block even if you aren't excited about it. Paper piecing really stretches my mind sometimes! I love that rocket! I might have to make one for my nephew, he's very into space now! I love your blue block!!! I hope you can fall back in love with it too. The rocket is awesome!